Another tragic storm chasing incident has occurred: a traffic crash on rural roads in the Texas Panhandle. There were three fatalities - 2 in a vehicle that ran a stop sign, and 1 in the vehicle into which they collided. All three victims of this were storm chasing at the time. I wrote about an eerily similar incident that happened in 2015, here. The evidence is mounting that being on the highways is indeed the most dangerous threat to chasers (and others). I wrote a guide to safe, responsible storm chasing decades ago, and I rated being on the roads as the #1 threat before anyone had been killed. At least 7 people have died in road wrecks during storm chases, that I know of. Additional fatalities are inevitable. It only takes a few seconds of inattention to the task of driving to result in terrible consequences. I am not somehow invulnerable to all this. I could be distracted by something while driving on a chase and be responsible for a fatal crash. Like the tragedy of the 31 May 2013 deaths of the Twistex team: Tim and Paul Samaras, and Carl Young - bad things can happen to anyone, even someone trying their best to behave responsibly. However, these recent traffic fatalities both involved a chaser running a stop sign. It might be possible to do so in relative safety on a rural road, but even on rural roads, it's both illegal and foolish to do. These are unnecessary deaths. The so-called "chase community" (which really isn't a "community" at all, but rather a group of people with a shared hobby) needs to take a long look at their behavior during their chase activities. If someone has done some irresponsible driving in the past, this might be a good time to resolve to discontinue such practices for good. This is the 2nd recent wake-up call, folks. The time is long overdue to get serious about ceasing illegal and unsafe driving during a storm chase [or any other time, for that matter!] No one gets a free pass on the roads, and this includes people chasing for TV. 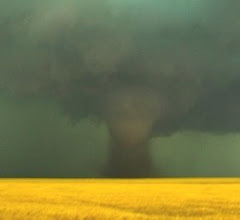 Supplement: Some news media have gone into attack mode on storm chasers as "thrill-seekers" as a result of this tragedy. If someone can witness the grandeur and beauty of the atmosphere and NOT get an adrenaline rush, I would have to wonder for what reason they're chasing. I see no problem with being a thrill-seeker - as I noted in my 2014 talk at ChaserCon. That doesn't mean we all have a death wish or are intentionally putting ourselves in imminent danger. The media narrative they always pre-suppose is that the people who do this are all crazy fools with a death wish. They struggle to grasp why people choose to chase and their pre-supposition blinds them to what chasers actually say. They look for a sound bite to support their already-written storyline about crazy storm chasers. Their usually crappy stories show they don't get it and likely never will ... see here. How ironic that we've visited this issue before yet, in the end, the people who most need to heed these rules seem to ignore them. Your past posts touched upon the eventuality of touching innocent lives and in this case, a passenger and a chaser, in the wrong place at the wrong time, saw their lives snuffed short because of blatant stupidity. Why does this utter stupidity continue to happen and what will it finally take to instill some common sense in people who behave this way? In this country, Christian Terrorist commit more crimes and murders than muslims however, Muslims are the most hated. Bicycle accidents are one of the leading causes of death but no talk about the dangers of the practice on the news. Had this accident occurred while there people were lighting a cigarette, there'd be no mention of it on the news. Inattention while driving, no matter what you're doing is wrong. But making this sound like it's totally because they were storm chasing is also wrong. Excellent post...really sad that this tragedy happened. We all can learn something from this and hopefully there isn't a repeat event down the road. I've chased a number of times since the early 2000s. Either with a tour group (3 times), with a mate (4 times) or on my own (once for a week after a chase with my mate). Whenever I talk to friends about this they of course believe that tornadoes are really dangerous. I always tell them that actually, whilst they are dangerous obviously, the biggest overall hazard is and always has been the driving. Increasingly the hazards are due to increased traffic due to the on-going popularity and ease of chasing. I always remember an occasion when the vehicle in which I was travelling very nearly ploughed into a stationary TIV. There were 2 things here. 1) The TIV had stopped on a road, not pulled off just stopped on the road (In front of it were presumably the usual circus associated with it), and 2) The guy driving our vehicle was very keen to keep an eye-ball on the multi-vortex tornado in the adjacent field (as were all the guests as well). fortunately one of the passengers shouted a last second warning. Even with an emergency stop we only missed Sean Casey's beast by inches. On this occasion had there been a third element - hail on the road or mud then we would have driven straight into that vehicle. I now assume every other driver will do something stupid - forget to indicate, stop unexpectedly, run a STOP sign, go too fast, go too slowly. I know I have my limitations as a driver and now try to ensure I always have far too much room to the next vehicle in front though to some this is just an open invitation of course. The other thing, of course, is you Americans do insist on driving on the wrong side of the road!